In today’s B2B environment, organizations grappling with the complexities of digital transformation are being bombarded with an endless array of technological options. According to Michael Keating, Senior Vice President, Global Marketing and IP Strategy, CGI, that can be incredibly distracting and make it hard to find the optimal solution. That is why cultural change and a more personal touch are central to Michael’s powerful message in our latest Viewpoint. Michael has front-line experience. CGI has been on its own journey for the past few years to double its IP-driven business solutions offerings while at the same time transforming its global organizational and innovation model. That transformation has been built on a strong foundation of combining technical expertise with cultural awareness in marketing and selling complex solutions. As Michael argues, the current digital transformation environment can seem overwhelming for business development communities and global clients. The danger is losing sight of the cultural change that is at the heart of success for firms and their clients. Every year CGI runs a program based on in-depth interviews with clients around the world, including business and IT executives. The interviews can take up to two hours, and invariably the topic of digital transformation comes up. And the biggest challenge? They can’t seem to find the right cultural balance to accomplish what they want to do both as clients and as individuals. At CGI, that translates into following a bottom-up approach. In other words, when the company is deciding how to advance into a market with a given topic or capability, the relevant teams build their campaign based on a deep understanding of local relationships. That calls for having the talent able to interpret these sorts of cultural conversations. 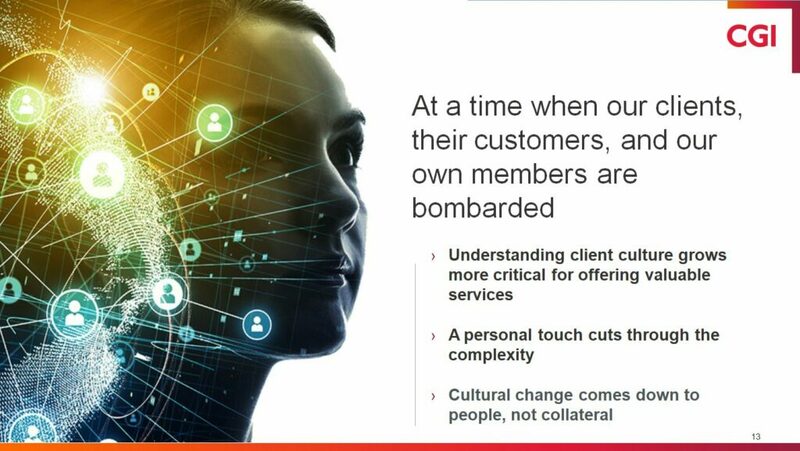 Read the Viewpoint to learn more about CGI’s story of how they used lessons learned from their own transformation to help clients manage change by providing for a more personal touch.